Official FBI statistics say that 76.4% of the time, when a woman meets with foul play - she knew her assailant(s). An FBI agent told me personally that the percentage is much higher: 'It's more like 90%", he said. Take your pick. The odds are between 76.4% and 90.0% that Kristen Modafferi knew whoever the person(s) are that caused her harm. Important: Kristen was only in the Bay Area for 23 days. June 1st, 1997 - June 23rd, 1997 before she vanished. She barely knew anyone. As far as we know - she only knew about 30-35 people. Just based on the FBI stats - there is a very good chance that one of these 30-35 people at the very least have some kind of information relative to Kristen's disappearance. With the exception of Jon Onuma, every name listed on the left hand side of this webpage is listed only because they had some contact with Kristen in her short stay in the San Fran Bay Area. (Roommates, co-workers and a few friends). They got to meet her. That is it. Names listed beneath Jon Onuma (in blue) are listed only because I came to learn of their identity through looking at Jon Onuma. Everyone listed - except Jon Onuma - is presumed completely innocent. I have always felt that the FBI stat is an important one and with the power of Google and Facebook - it would be irresponsible to Kristen to not at least try this in an effort to gain some info as to what happened to her back on June 23rd, 1997. Please remember that Kristen's roommates and co-workers are in fact - most probably innocent, innocent, innocent of having anything to do with Kristen's disappearance. All that is happening here is that I am taking the FBI stat of 76.4% and casting out a very wide net and just hoping somebody with information has a conscious and sends in a tip. suspect: Out of the blue, my phone rings about 2:00pm on Tuesday, February 9th and for the first time in over 6 years I am speaking to the prime suspect in Kristen's disappearance. I should define 'prime suspect' here at the start. For the past six years, Oakland Police Department has focused solely on Jon Onuma as being somehow involved with Kristen's disappearance. Officer Patrick Mahanay has been the lead investigator on this case since day one. I need to emphasize to the readers of this website that I am not in the loop from the police departments point of view. In no way do I want to give the impression that they take me into their confidence and tell me what is going on in the investigation. I do know, however, that they read this website because they have told me that much. Onuma is the one who made the phone call to the ABC studio annonymously saying two lesbians killed Kristen and that one of the gals worked at the local YMCA. Mahanay interviewed these women and it was obvious from the start that they had nothing to do with this. The women told the police that a guy named 'Jon Onuma' made the phone call - and that is how he surfaced in this case. Jon told me on the phone that making that phone call was just a dumb mistake and that he will be paying for it the rest of his life. He repeatedly told me that he was aware that he brought this all on himself and that he has no one to blame but himself. "I want to clear this up so it will go away, Dennis", he said. "I have nothing to do with Kristen. I put the blame on those women because they were hassling my girlfriend, (Jill Lampo) at work and I just wanted revenge so I made that stupid call." Jon went on to say that he has begged the OPD to take a polygraph but that they refused to do so. He told me that he would "go anywhere, do anything" to help clear his name. He kept telling me that would readily agree to take a 'chemical polygraph' but that no one will take him up on it. Beyond that - Jon said he would spend as much time on the phone with me and answer any and all questions I had. To his credit - he lived up to his word on that score as we spent about 90 minutes on the phone. He never got angry at any question I had for him and told me I could call him anytime. Ok - that is the good side of Jon Onuma. Here is the other side. He recently got a woman pregnant and has skipped out on any parental responsility. The child will be born in a couple months and he claims he has no idea where the woman is. "She lives in a van with her mother. I haven't seen her in about 7 months." A woman in NJ claims Onuma raped her as did another gal in San Francisco. A gal south of San Fran went on national TV claiming Onuma was violent and burned her repeatedly with cigarettes. That is just some of what I know. Then there iare the credit card scams stealing almost 20,000 worth of camera equipment from B+H Photo in NYC and having them delivered to the A-OK Mail Drop located at 350 Ward Avenue in Honolulu, Hi. There is more but I am not posting it at this time because it does not serve Kristen's interests to let Onuma know what else we know. This is just what I know. It is my guess that the Oakland Police have alot more on this guy. Ok - so Onuma is no choir boy. Even he will admit to that. With that said - is he capable of actually harming Kristen (if he in fact has met her?) Well - that we just do not know. If he is just a low-life scoundrel that has nothing to do with Kristen - then we need to know that as well so we can all be quickly be rid of him and everyone focus our efforts elsewhere. To that end, Onuma is saying he is so worn out by all of this that he is willing to help up find the truth. I have asked Onuma to provide proof of his travels outside the country since 1997. This is important because of the tip we received that Kristen was seen alive in Granada, Nicaragua in May 2000. Onuma claims he has been to Germany and Thailand but never to Central America and he said that he will get a printout of his passport activity and send it to me. There is more - but I feel that it is best for Kristen that I not post stuff here and just let Oakland Police handle it. I am convinced that OPD has 500 times more info on Onuma than I have so it is important to let them do their job. Ok - stay tuned everyone. I will keep you posted. Out of the blue, my phone rings about 2:00pm on Tuesday, February 9th and for the first time in over 6 years I am speaking to the prime suspect in Kristen's disappearance. 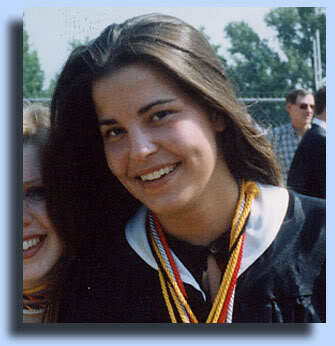 The future was bright for Charlotte resident Kristen Modafferi on June 1, 1997. It was her 18th birthday and she was flying to San Francisco to spend a summer exploring the city. She would begin photography classes at the University of California Berkeley on June 24. As a member of the first class of Park Scholars at N.C. State University, she had completed her freshman year as an industrial design major and had been encouraged to plan an enriching summer to share with her peers at the start of her sophomore year. But the life experiences the Providence High School graduate had hoped for never came to be. On June 23, Kristen left her shift at a coffee house in the financial district of downtown San Francisco and disappeared. To the heartbreak of her parents, Bob and Debbie Modafferi, her case remains unsolved. Because Kristen was 18, law enforcement classified her as an endangered/at-risk adult, so child-search organizations such as the National Center for Missing and Exploited Children were unable to feature her in their notices. There were also no federal or state funds to assist the Modafferis in their search, and social networking was years away. With no significant clues, a remembrance mass was held for her at St. Matthew Catholic Church in June 1998. Inspired by the crisis, Joan Petruski-Scanlon, a neighbor of the Modafferis in Providence Plantation, asked them if she could help raise awareness and funds to maintain the search. What began as a kind gesture evolved into a nonprofit organization that helps search for missing adults nationwide. In 1999, Petruski-Scanlon launched The Kristen Foundation to provide financial and informational assistance to family members of missing persons older than 18 and designated as endangered/at-risk by law enforcement. To date, the organization has provided emotional support and assistance to more than 100 families in their searches for loved ones. Petruski-Scanlon, who works strictly as a volunteer, is determined to reach more. "I have many goals for the foundation, most importantly to create a base in all states, which we have started to do. All information and financial assistance would still come out of Charlotte, but others will run the foundation and help families in their state," says the 60-year-old mother of two grown daughters. More than $200,000 has been raised so far through the annual Crystal Ball Dinner Dance and Golf Classic events as well as the sale of cookbooks, DNA Legacy Testing Kits and memorial bracelets. "The monies are used in many ways. We provide fliers, billboards, private investigators, search teams and travel expenses for family members. We also buy equipment for search teams and sheriffs' departments," says Petruski-Scanlon. "Where we cannot always bring a loved one home alive, we have been successful in bringing closure to many families." She also educates young adults on effective personal safety and security, gives speeches on what to do if a loved goes missing and lobbies national, state and local leaders to provide strategies for effective investigations. Petruski-Scanlon stresses that the foundation needs help in many areas, particularly in getting information about the foundation out to the public, assisting with fundraisers and promoting the sale of the "Expect Miracles" bracelets. She would appreciate donations or help from anyone interested in getting behind her cause. Petruski-Scanlon remains close to the Modafferis and says, "They go about their lives as we all do, but with a place in their hearts missing." As the result of lobbying by the Modafferis, Kristen's Law was passed in 2000 to help families searching for missing adults. This law helped establish the National Center for Missing Adults, which provides funding for searches. On their website dedicated to finding Kristen, modlink.com, the Modafferis say they fear Kristen could still be at risk, unable to contact her family or friends, and they say, "...we cling to the hope that she is still alive and we remain very proactive in the search to find her." With the 15th anniversary of Kristen's disappearance approaching, Petruski-Scanlon says she will be doing billboards and other media in California to keep Kristen's profile in the public eye. "I will try to never let Kristen be forgotten. She was here for only a short time - a beautiful, bright young lady. The Kristen Foundation is her legacy. So many families have been helped through her, and we would love for her to come home." nitespinr for updating this thead. I love to read how tragedy created something good. CHARLOTTE, N.C. — Fifteen years after the disappearance of their daughter, a Charlotte family is asking for clues to solve the case. Kristen Modafferi was just 17 years old when she was last seen leaving her job at a coffee house in San Francisco. The sophomore at NC State University was taking a summer course at the University of California at Berkley. Police suspected foul play, but never found the teen. The family went to Frazier Park on Saturday to remember the Charlotte teen. Standing near pictures of their daughter at the park's children's memorial walkway, Bob and Debbie Modafferi said they didn't think they'd be here so many years after her disappearance. "We thought we would get a quick resolution and find out what happened to Kristen. It just didn't come to pass, "said Bob Modafferi. Today her parents thanked the Charlotte community for praying for them. "What we're asking now is that you pray for the person who has those answers that we so desperately need and seek." "Please please have the courage to come forward with those answers so we can bring Kristen home and be at peace," pleaded Debbie Modafferi. A neighbor of the Modafferi's created the Kristen Foundation to help the families of missing adults. "This is her legacy…she has helped so many people. We have brought people home because of her. We have given resolution to people," said a neighbor. The National Center for Missing Adults is a United States organization which assists in tracking missing adults. The organization was created in response to the disappearance of Kristen Modafferi, a former college student from Charlotte, North Carolina, who vanished without a trace on June 23, 1997, three weeks after her eighteenth birthday. Having just completed her freshman year at North Carolina State University, she had gone to spend the summer in the San Francisco Bay Area for the purpose of working and going to school. Because she was 18, the lack of resources available for searching for her were noted. Her case has been profiled on Unsolved Mysteries, Primetime Live and America's Most Wanted. The Center's federal funding ran out in 2005, and has continued with volunteer efforts.